In upstate New York, many people refer to Snow Birds as the Canadian people who travel through the state in the Spring after spending the winter in Florida and other points south. There is another kind of snow bird who also travels through New York on their way to Canada’s Nunavut province. Nunavut is the northernmost territory and encompasses most of Canada’s Arctic Archipelago. These birds are the large white Snow Geese which spend half the year migrating between their breeding grounds in the Arctic Circle and warmer climates in the United States and Mexico. 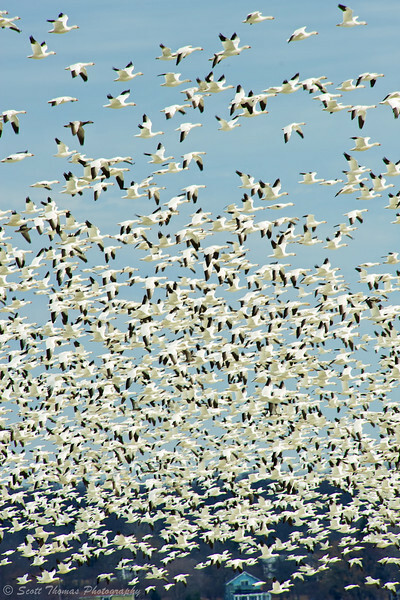 During late February and early March, millions of Snow Geese migrate through upstate New York’s wetlands and lakes. I found references the snow geese were at the Montezuma National Wildlife Refuge and Cayuga Lake over the past week and headed out to find them. At Montezuma, I only found their cousins, Canadian Geese, and a couple of Bald Eagles sitting out on the ice of the pools. 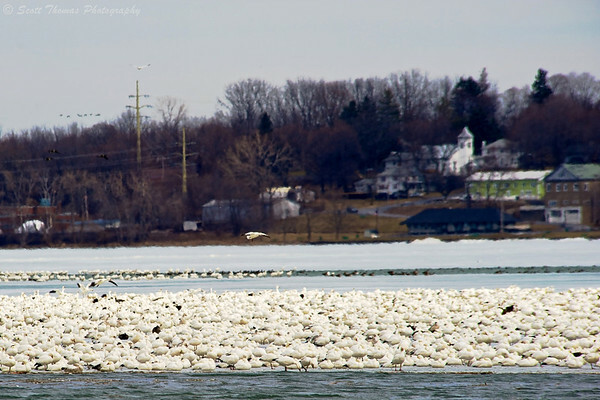 I increased my search area and found the Snow Geese on the ice near the boat launch at Cayuga Lake State Park. Thousands of geese were standing and resting on the ice about 50 yards (45 m) off shore. 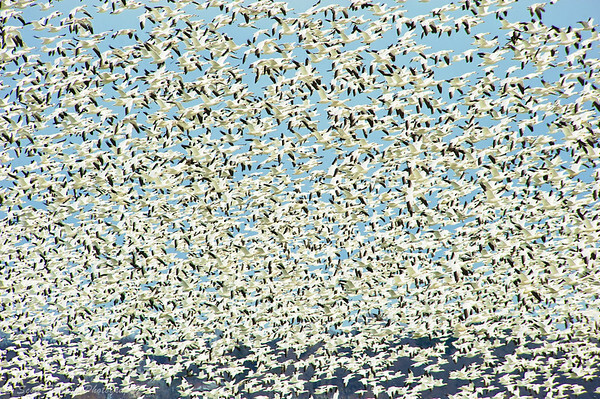 Thousands of Snow Geese on the ice of Cayuga Lake near Seneca Falls, New York. Nikon D700/80-400VR, 1/40s, f/9, ISO 200, EV +0.3, 400mm focal length. Snow geese are large birds with wingspans ranging from 53 to 65 inches (135 to 165 cm) and weighs an average of 7.1 pounds (3.2 kg). Their plumage is white except for black wingtips. Snow geese were flying low over the geese filled ice looking for a place to land. Once a place was found, they did a few braking wing flaps and gently landed without sliding as some waterfowl tend to do. Snow goose flying over the ice looking for a place to land among the thousands of geese already on Cayuga Lake. Nikon D700/80-400VR, 1/400s, f/8, ISO 200, EV +0.3, 400mm focal length, cropped. For years, I have marveled at photographs of large migrating flocks of birds literally filling the sky. As I was looking out over the thousands of snow geese in front of me I tried to imagine all these birds in the air at once. Then, out of the corner of my eye, the geese started rising. Before I knew it, the entire flock was in the air. The movement of all those wings and sound of the geese honking was AWESOME. The far shore of homes and trees disappeared and the sky filled with snow geese. I do not know what brought it on but within five minutes most of geese were back on the ice. About a third of them had moved to a different part of the ice up the lake. I do not recall breathing as I snapped off shot after shot. Composition wise there was not much to do except rotating the camera to portrait for a different prospective. Snow Geese over Cayuga Lake near Seneca Falls, New York. The old Nikon 80-400VR lens may be getting replaced but it still is one fine lens to use to capture wonderful photographs like these. 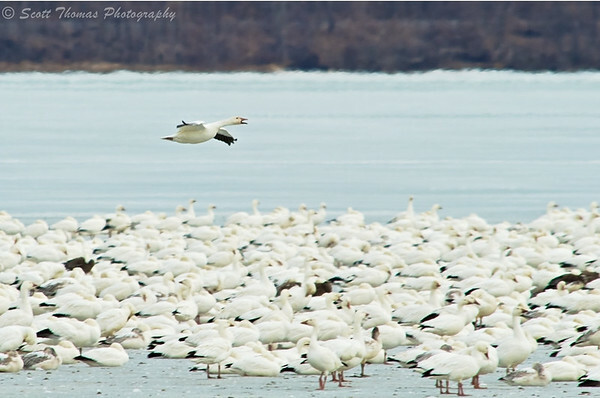 This entry was posted in Animals, Weekly View and tagged 80-400mm, birds, cayuga lake, finger lakes, migration, new york, nikon D700, seneca falls, snow geese, spring, vr, water, white, wildlife, winter. Bookmark the permalink. Scott, it must be a sight. I have never seen this many birds in one place before. It was, Nye. This was the largest such gathering I have ever witnessed, too. Wow, this must have been an impressive experience. And the last two photos are beautiful and unique.